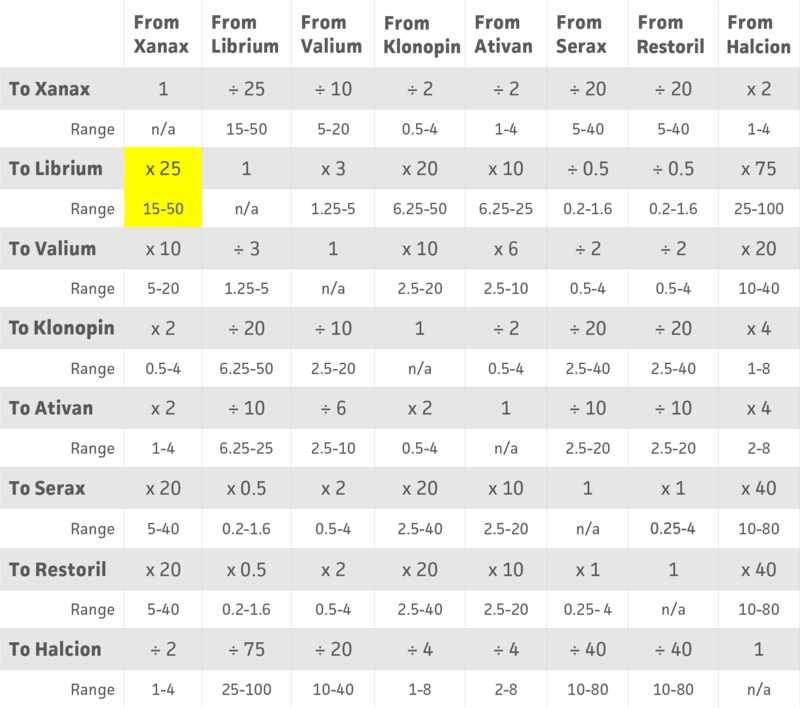 This calculator should be used as a reference for oral benzodiazepine conversions. Equipotent benzodiazepine doses are reported as ranges due to paucity of literature supporting exact conversions, thus reported ranges are based on expert opinion and clinical experience published in psychiatric literature. Do not use to calculate initial dose for a benzo-naïve patient. Intended for use when interchanging benzodiazepines and should not be used to help calculate an initial dose for a benzodiazepine naïve patient. Very short acting: <6 hours. Short acting: 6-12 hours (alprazolam, oxazepam). Intermediate acting: 12-24 hours (lorazepam, temazepam). Long acting: >24 hours (chlordiazepoxide, diazepam, clonazepam, triazolam). This calculator does not account for age, organ function, and inter-patient variability that may alter the pharmacokinetics, peak effect, and duration of action. Selecting doses on the lower end of the reported range may result in lower risk of unwanted oversedation. Dosing conversions may not be adequate when treating such conditions as status epilepticus or alcohol withdrawal. Disease-state specific guidelines should be utilized. Abrupt discontinuation of benzodiazepines should be avoided as this can precipitate withdrawal symptoms, including severe agitation and seizure activity. To convert 1 mg Xanax to Librium, multiply 1 mg x 25. For a range of equipotent doses, multiply by 15 and 50. Gelenberg AJ, Bassuk, EL. Practitioner's Guide to Psychoactive Drugs. 4th Edition. Springer, 1997. Ashton H. Benzodiazepines: How they work and how to withdraw. The Ashton Manual, 2002. Gitlow S. Practical Guides in Psychiatry: Substance Use Disorders, 2nd Edition. Lippincott Williams & Wilkins, 2006. Tyrer PJ, Silk KR. Cambridge Textbook of Effective Treatments in Psychiatry. Cambridge University Press, 2008. Latt N, Conigrave K, Saunders JB, Marshall EJ, Nutt D. Addition Medicine, 2nd Edition. Oxford Specialist Handbooks, 2009. Labatte LA, Fava M, Rosenbaum JF, Arana GW. Handbook of Psychiatric Drug Therapy, 6th Edition. Lippincott Williams & Wilkins, 2010. Lorazepam [package insert]. Corona (CA): Watson Laboratories, 2010. Diazepam [package insert]. San Francisco (CA): Genentech Laboratories, 2016. Procyshyn RM, Bezchlibnyk-Butler KZ, Jeffries JJ. Clinical Handbook of Psychotropic Drugs, 22nd Edition. Hogrefe, 2017.